This low-end 4.3-inch Android 5.1.1 Lollipop-powered handset is currently being tested and could launch soon for less than $100 USD. The Samsung J family of devices seems to be increasing with each week that goes by, and this is not about the updated Galaxy J5 and Galaxy J7 that keep showing up in the rumors lately. Samsung Galaxy J1 and Galaxy J1 Ace are already available on the market and both aim first-time smartphone buyers with a very limited budget. 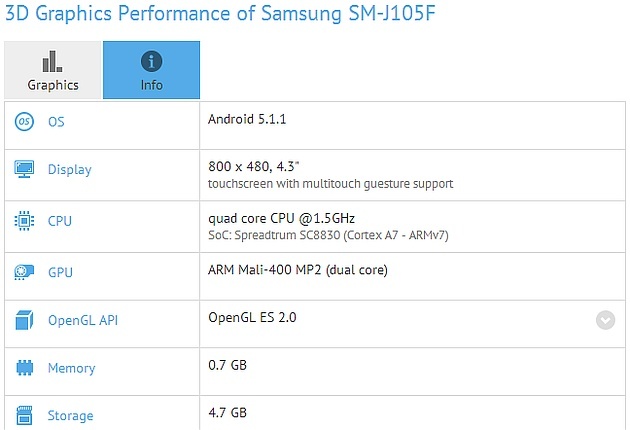 Now, a "mini" Galaxy J1 appears on GFXBench, and it looks like it will not take long until it hits stores as well. 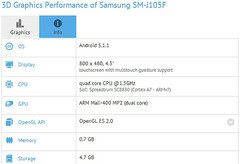 Samsung Galaxy J1 model number SM-J105F has been spotted on GFXBench and its features include a quad-core Spreadtrum SC8830 SoC with ARM Mali-400 MP2 graphics, 1 GB RAM and 8 GB internal storage, a 4.3-inch display with 800X480 pixels, as well as modest cameras - 1.3 MP front and 5 MP on the back, all with Android 5.1.1 Lollipop on top. Samsung Galaxy J1 mini is expected to retail for less than $100 USD, but will probably launch in India and other emerging markets, same as its siblings. Once that happens, we should get information about its international availability as well.